So I mentioned a few posts ago that Phil and I have bought our first house together, and I'm so, so, so excited to have a place that we actually own! But I'm going to be really, really, really, sad to move out of the little flat we've called home for the last nearly-two years. Renting gets a really bad rep. If I had a pound for every time I'd heard the phrase "burning money", but I think it's important to address the other side of the argument. I have absolutely no regrets when it comes to renting. When we moved into our flat, we'd been together just over a year. We knew each other pretty well, but I always say there is absolutely nothing like living together - it will either make you or break you. Renting has given us plenty of time to find out if we can actually live together! Living together can be hard work, and it's good to get a taste of how you'll get on when you see each other every day! We've been together 3 years now and even after living together for nearly 2 years, it's still a big deal to be committing to a 30 year mortgage! I also don't regret renting because it's given us an opportunity to live somewhere we wouldn't have been able to afford, or want to, buy a place in. I absolutely adore city centre living, and I'm going to miss it incredibly, but long term, it's not somewhere I want to live forever. 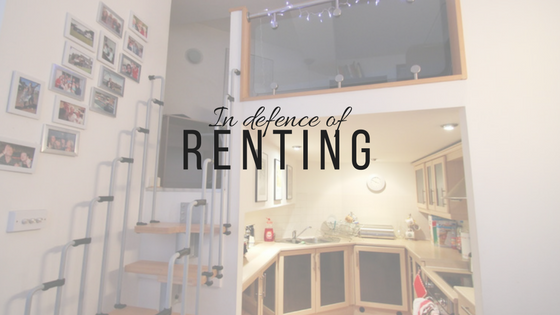 Renting has given us an amazing opportunity to live in the city centre without the long-tern commitment. Plus, despite "burning money" I think renting has given us a lot of discipline when it comes to spending and saving money. You have to be good with money to afford city centre living, and it's forced us to be really careful, get used to paying council tax and electric bills and we have very specific budgets for food shopping and socialising that we have to stick to. We both put away a certain amount of money every month, and I think having that structure and discipline has helped us to not be too reckless with money. When I lived at home I managed to spend a lot of money, and I have no idea what it was on! It was easy to spend more money when I didn't have to worry about it because I worked full time and lived at home! Finally, I'm constantly amazed at how much time having your own place takes up! Cooking, cleaning, planning, washing... all the little things that mean Sundays are pretty much a write-off. Sure, we both lived away at uni for years but it's nothing like having your own place - my standards are definitely much higher than when I was 19! I'm glad I've had a couple of years experience of looking after a little flat before we move into a 3 bedroom house, and it's been good to test the water in a flat where we can call our estate agent if something breaks or floods or falls apart before we get a house and have to fix that stuff ourselves! I love having the independence and our own space full of our things and our choices and having our own schedules. I love my parents and had a great time living with them, but moving in with Phil has been one of the best things I've ever done. I'm excited to move into our house, but I'm so glad we've had two wonderful years living in Manchester city centre together first, and I certainly don't feel like we've been burning money. Renting might not be everyone's first choice, and I can definitely understand waiting until you can afford a deposit before moving out, but for us, it's definitely been the best decision, and I'll be so sad to leave our flat!